When fellow Graphic 45 Design Team member Nichola Battilana suggested our group do a tag swap, I jumped at the opportunity. I thought a tag banner would make a wonderful keepsake of the past year's team. And it is, after all, my last year on the team...for a while. (Graphic 45 has a two-consecutive-year rule.) So what a great tribute to the fantastic artists and reminder of the great collections we've been creating with all year! All of my tags are regular size ones from Graphic 45. 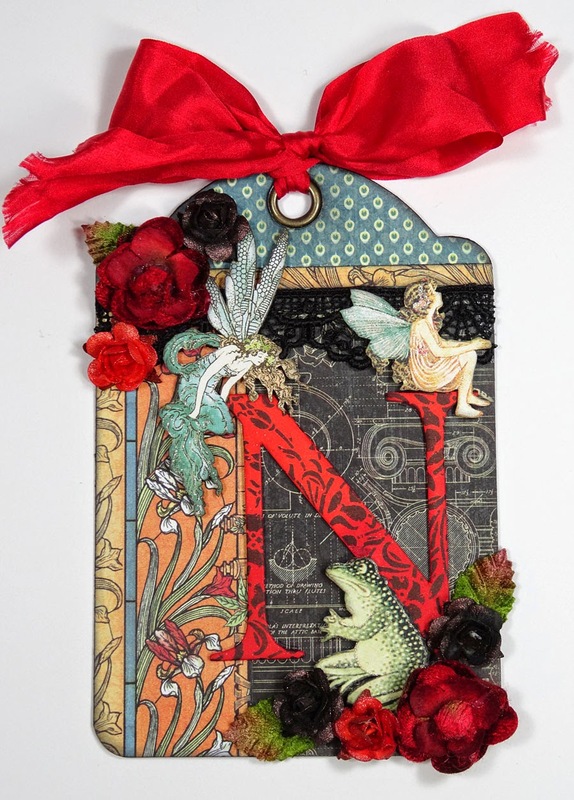 I varied from the Ivory, Black and Kraft tags depending on the paper collection I used. Each tag has been created from a different G45 paper collection (or mixture of two) and each one has a monogram of the team member I made it for. Each team member's name and link to their blog is in the right hand column of my blog page if you'd like to visit them and see their unique styles. The first one is for Nichola herself. I know she is quite fond of Artisan Style so I incorporated some of it in the background. I tried to capture Nichola's whimsical personality with the fairies and the frog fussy cuts from Once Upon A Springtime. 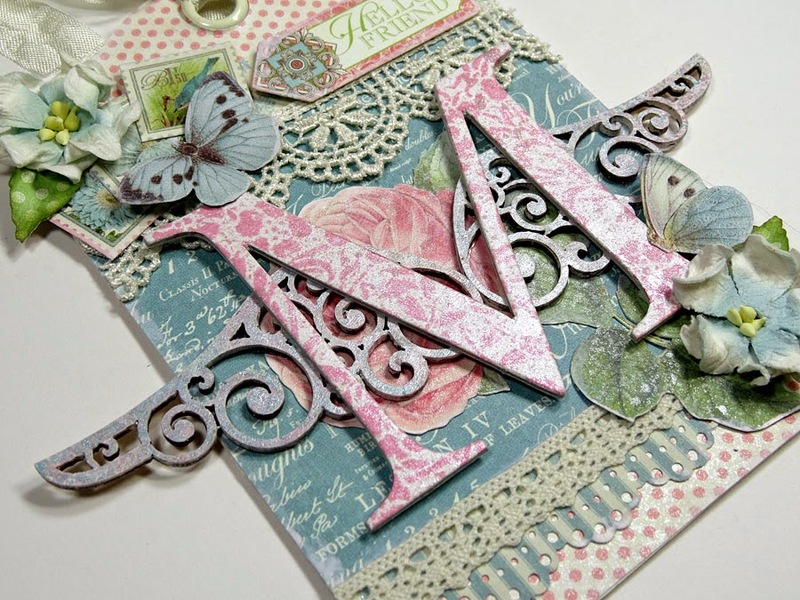 The monogram was a plain white chipboard piece that I inked with bold color, then stamped with one of the Artisan Style stamps. 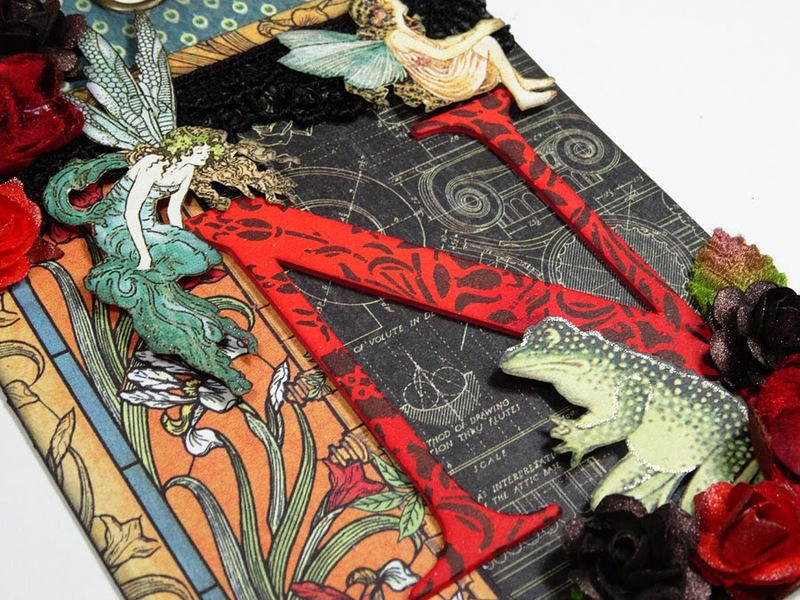 The fairies and frog have slight touches of glimmer using a Gelli-Roll Stardust pen. 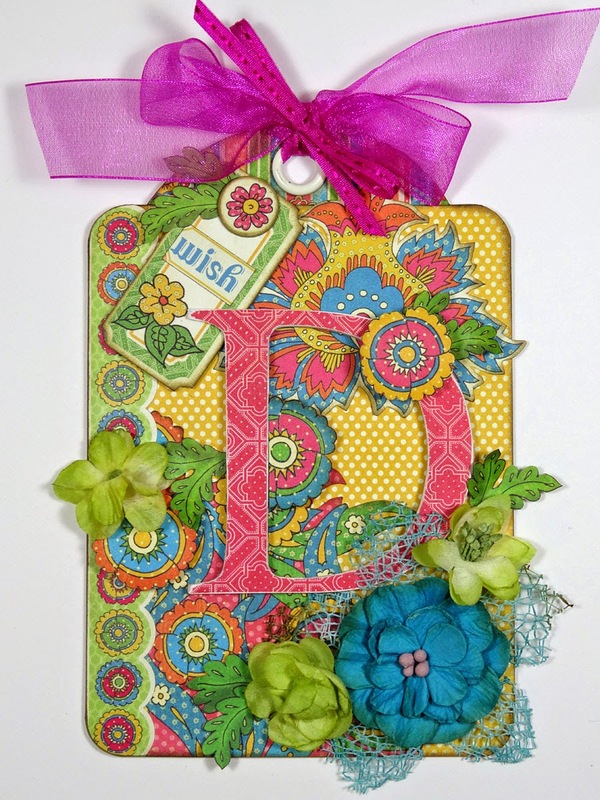 Petaloo flowers in bold deep colors embellish the rest of the tag. 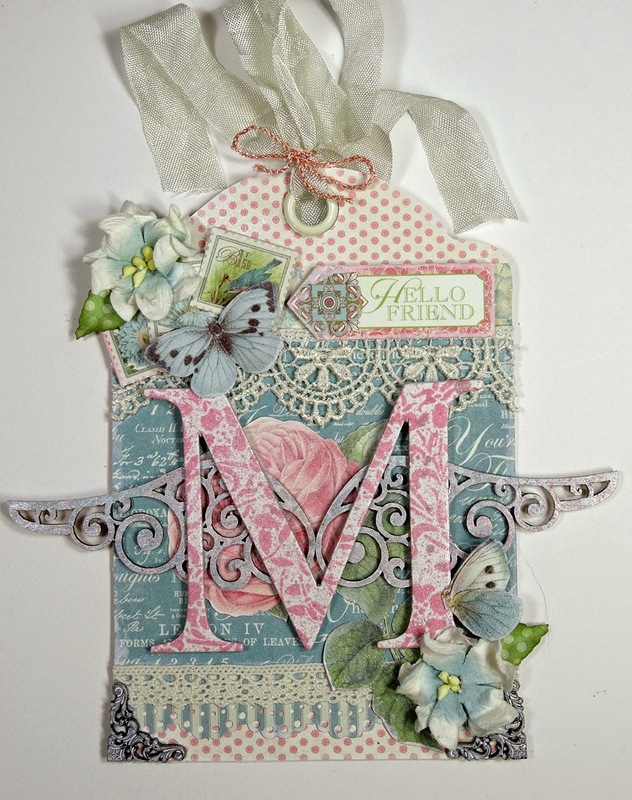 Next up is my tag for Miranda Edney. Her style is so distinctly shabby and feminine. I used my own style and took inspiration from hers to create this tag with one of my all-time favorite collections Botanical Tea. The wings are laser-cut wood pieces painted with tints of blues and pinks, as are the metal photo corners at the base. Edges are sanded and painted with ivory paint, and the monogram is stamped then spritzed with Perfect Pearls spray for a bit of shimmer. This fun one is for Rhea Freitag, a fellow grunge gal. We both love the deeper colors, steampunk, and vintage. In fact, if I were making a tag that fit my style best, this one would be it. Typography is definitely on the very top of my favorites list of G45 collections. Rhea, as well as Nichola and Miranda and I have shared the past two years on the G45 team together. 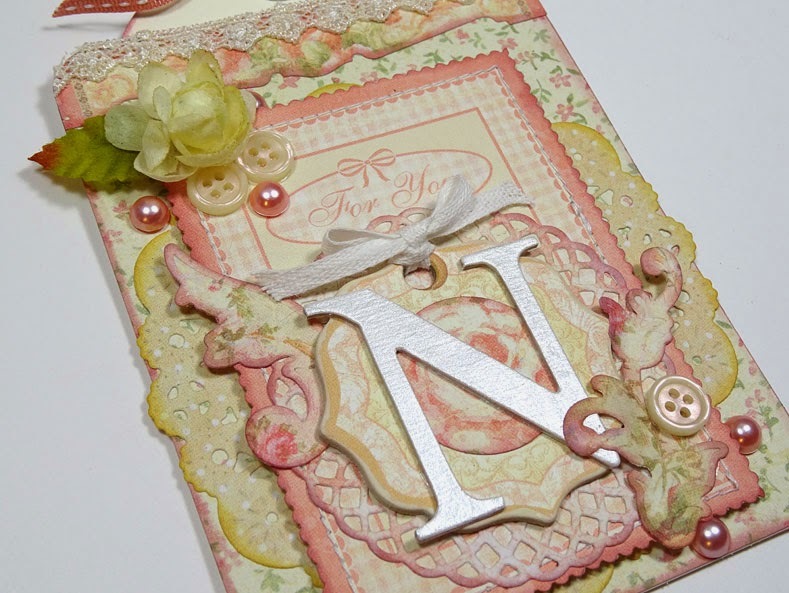 This pretty one is for Nadya Lifa and represents her beautifully soft and feminine style. I used the Deluxe Collector's Edition of Baby 2 Bride, plus some lace, buttons, pearls and shimmer. 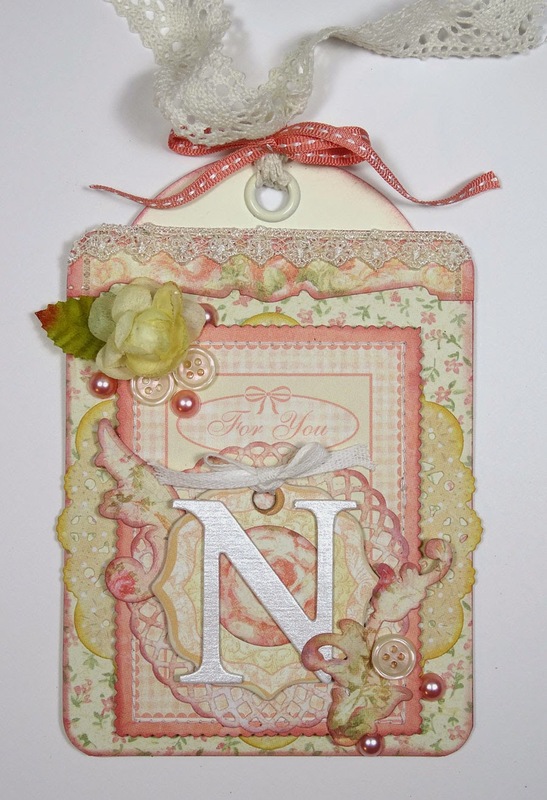 Chipboard, Spellbinders dies, Petal flowers, and some sewing pull this tag together. It was a fun one to make, and Jamie says it's her favorite one. 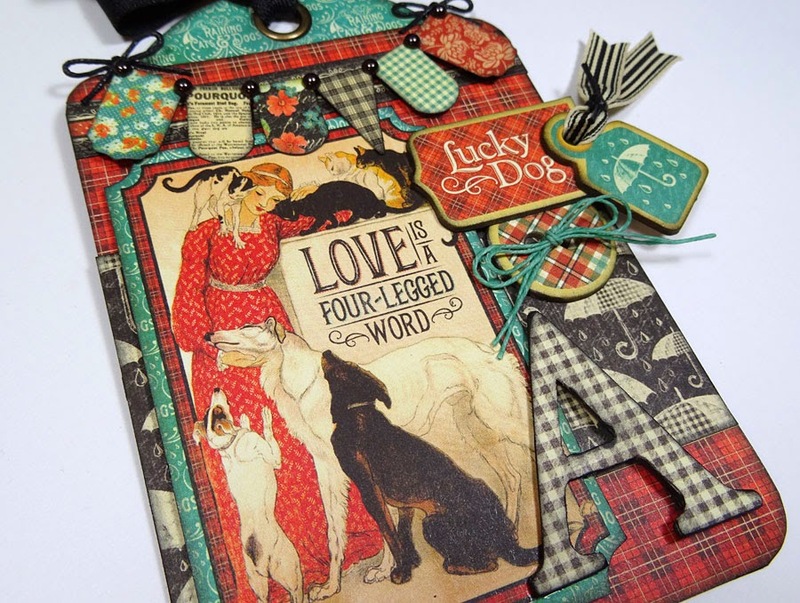 This pet-lovers themed tag is for our guy Andrew Roberts, who I know has dogs way out there in Australia. I bet my Suki would love to meet them! Andrew's clean, balanced style inspired me while making this tag. I used the Raining Cats & Dogs collection. Banners, chipboard, ribbon and twine, plus a lot of inked black edges make this a masculine tag while not being so literally manly. I hope he likes it. 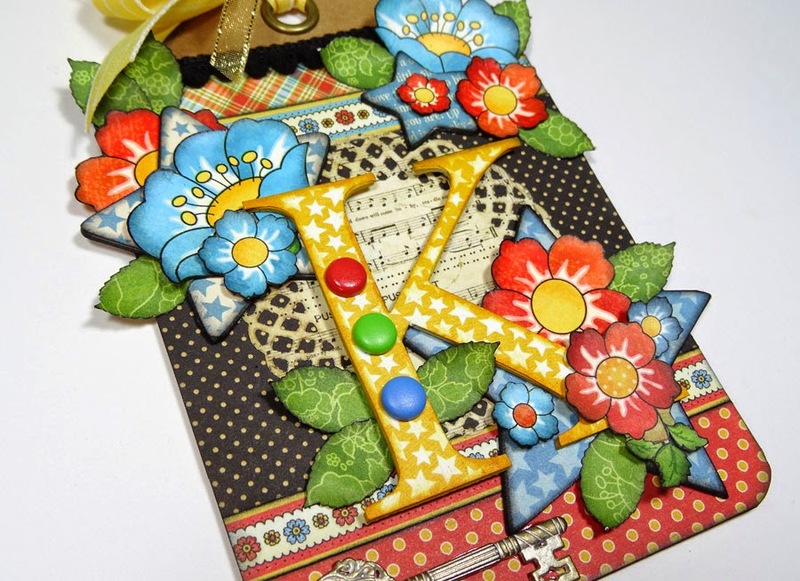 This bright, bold beauty is for miss Tati Scrap herself, Raquel Martin Fernandez, from Spain. I used Times Nouveau (another Deluxe Collectors Edition). 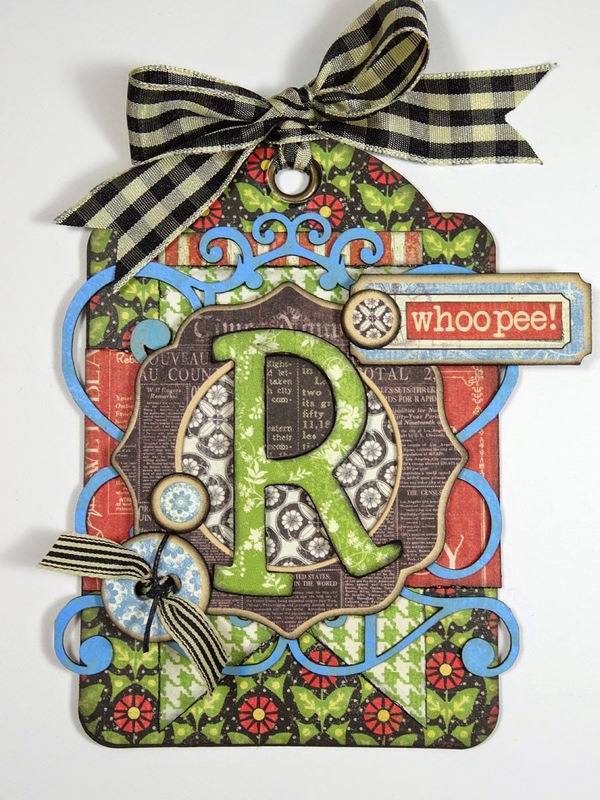 Tati Scrap's style is inspiringly bold and colorful and fun, and I notice she always uses laser cut pieces in her designs, so I incorporated some for her in this tag as well. 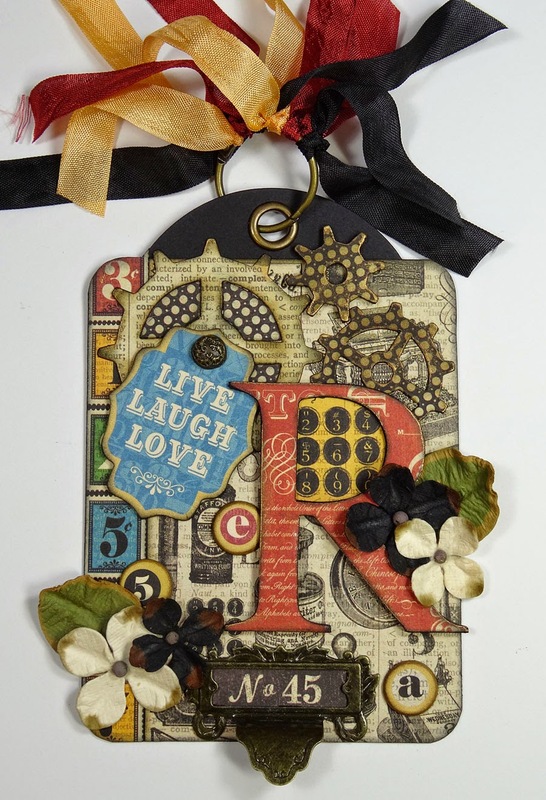 Layer upon layer makes this tag really pop! Whoopee! 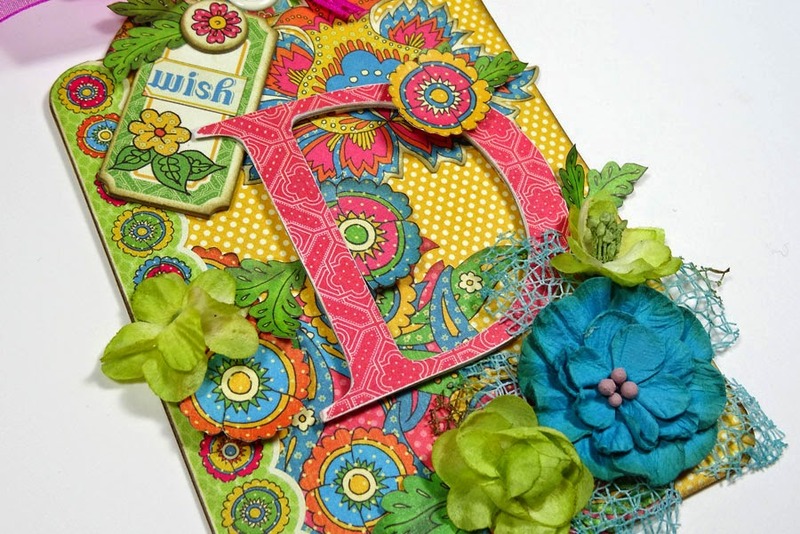 And talk about bold and bright, this Bohemian Bazaar tag is for Donna Espiritu from Saudi Arabia and is totally inspired by Donna's wonderful creations. Always using a pop of bright pink in her designs, I mimicked that on her monogram and the ribbon on top. 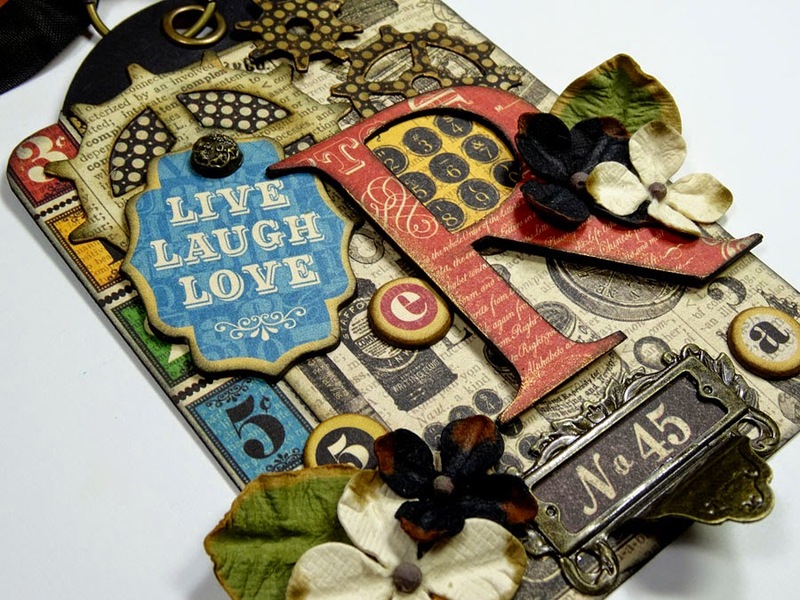 I loved pulling out my older Bohemian Bazaar scraps and working with them again. 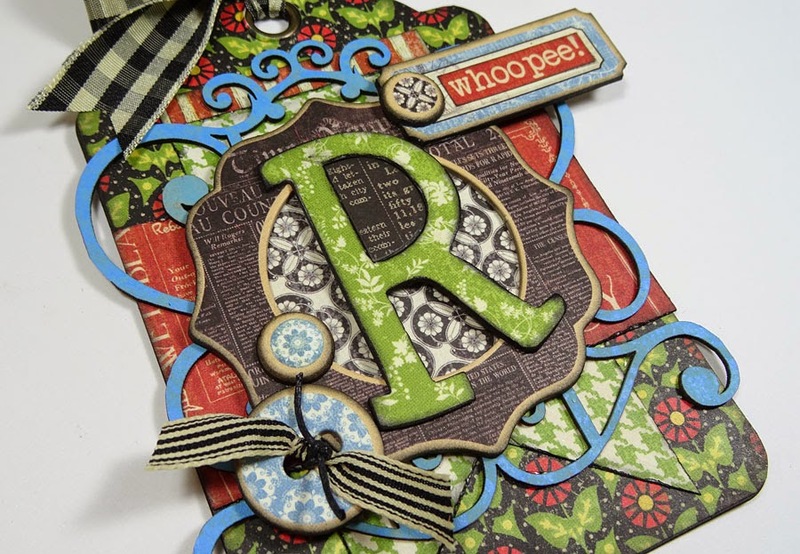 And of course, Petaloo flowers match everything Graphic 45 comes out with! 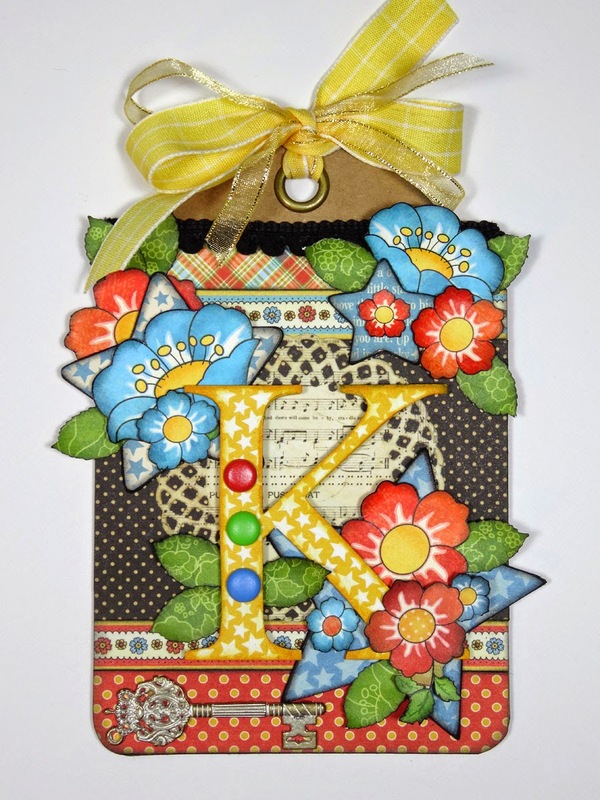 This fun, flowery tag is for Katie Zoey Ho from Singapore. I always remember her whimsical, adorable layout of her little niece that she made with Mother Goose papers. Katie's style is so varied and fresh. I hope I did her justice with this bright color combination. Finally, my last tag is for Ginger Ropp, right here in the USA. (Washington). If I had the time, I would have made her tag into a mini album because that's what Ginger is ALL about: her fantastic minis! I chose Home Sweet Home because I felt it was the best collection that tied Ginger and I together. We're both close in age, have similar styles, and I've even been told that I sound like her in my videos! (LOL!) Even though I'm not yet a grandmother, I know Ginger is. This collection brings back wonderful memories of my mom and grandmother pickling, canning, and baking. I hope my team mates enjoy these monogram tags, and I can't wait to receive mine from them! Now, how about YOU tell me what your favorite Graphic 45 collection has been over the past two years (my term on the team) and I'll draw a name at random on Wednesday and announce the winner here on my blog. The winner will receive a personalized monogram tag from me using their favorite collection! Thanks for stopping in! Best of luck to everyone!! These are stunning and I'm sure will be eagerly awaited by their intended! As for me- I would have to decide between Botanical Tea- famine and gorgeously illustrated, Mother Goose- love the bright colours and retro nursery rhymes or The new Home Sweet Home- so many possibilities! Botanical Tea! I want to say right off the bat that your tags are fabulous. 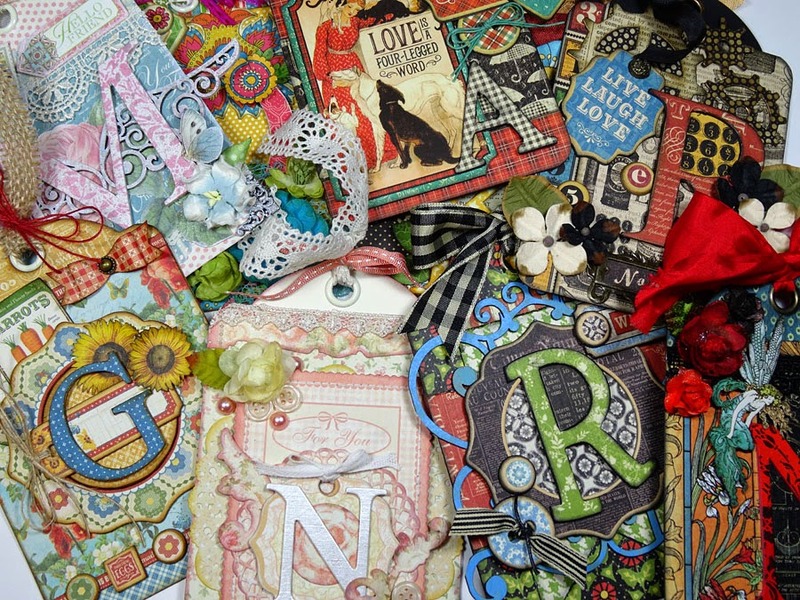 As for my favorite G45 collection, right now I am loving Home Sweet Home but my favorite has to be Mother Goose. I made so many of your Mother Goose tag albums I could almost do them in my sleep. Then I made a year in review foto folio by Paper Phenomenon using Mother Goose that just turned out beautiful. Of course these are both for my first great grandchild which has not even be thought of yet. Oh well happy crafting everyone. Because I am a teacher, my favorite collection is ABC Primer. Thanks! Thanks Bunches for a chance to win. Love your work and will miss you being on G45 DT! But I know you'll continue to inspire anyway. I love your designs! My favorites? French Country and Botanical Tea! I love the variety of different types of tags you made, taking each Team Members personalities and likes into your creation of the tags. I'm sure each one will be treasured. Once Upon a Springtime brings back so many memories of the best part of my childhood, Dad reading books to me each night. We love when we emotionally connect so, although, picking a favorite Graphic 45 line seems impossible, I went with the one that made me the happiest. They are all beautiful Annette! I think the pet lover one would look great with a "G" on it hehe. Wow! I absolutely love these tags! Of course I'm a bit biased as G45 is my favorite paper designer with their French Country being one of my all time favourites. Baby 2 Bride is a collection that i have not seen up close, so this would be my choice. All the best in the future, you inspired us greatly. 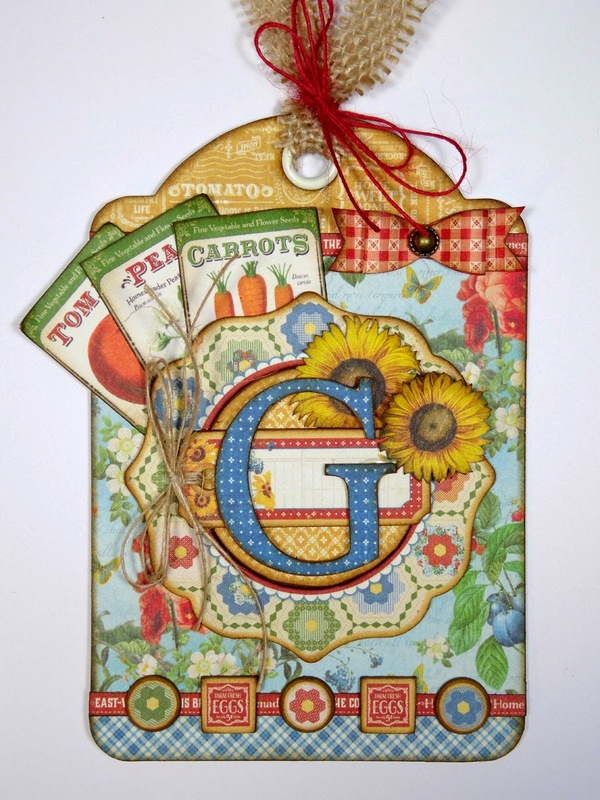 Gorgeous tags-the Mother Goose tag is stunning with the beautiful bright colors. I LOVE everything G45. I have been collecting since they first started the company. My all time favorite is ABC Primer-I have made so many projects with it and I love ever single one. I enjoy all your creations-thanks for sharing!! Wow your tags are all works of art, all are beautiful! I would have to say that Miranda's and Nadya's really tugged at my style. 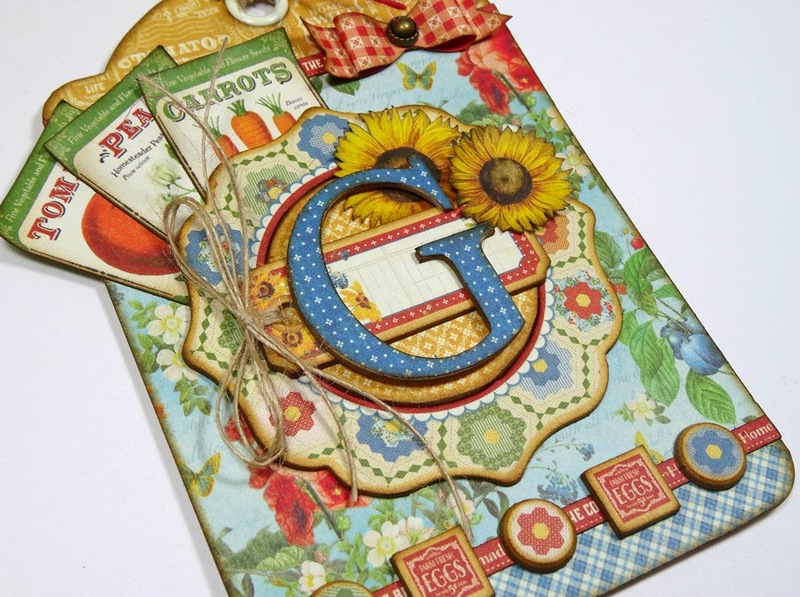 I would have to say my favourite all time G45 paper has been a tie between A Ladies Diary and Botanical Tea. What a wonderful prize you're offering! Your work is fabulous. I too am a grunge girl! Love the typography collection. Beautiful work. I must say Mother Goose is my fav for now (not that they aren't all beautiful). Working on decorating my daughters old room with Mother Goose decor items (altered of course) for when I become a gma!! I love your designs! My favorites are French Country and Botanical Tea! Each one of your tags is a knockout in it's own right! 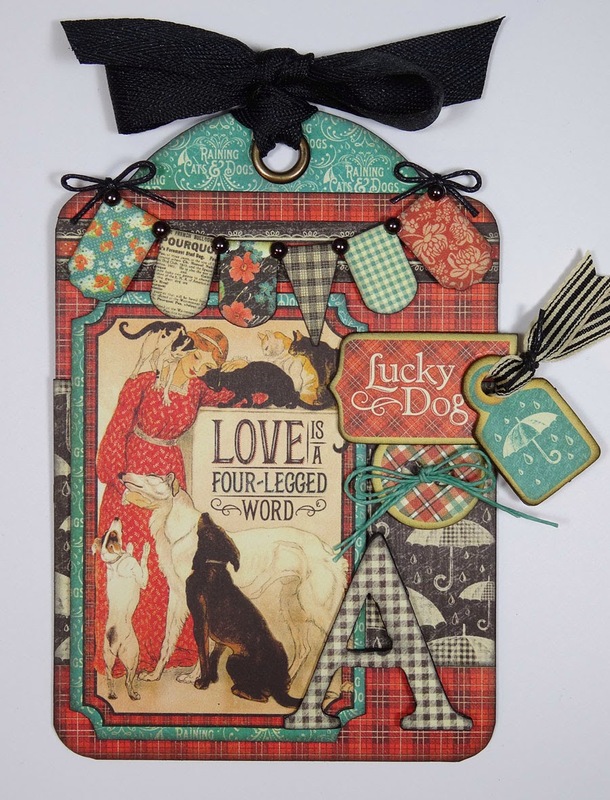 My very favorite G45 paper set is raining Cats & Dogs, the close second is Once Upon A Springtime. Beautiful tags. You have given me the inspiration to try a swap with some of my scrappy gals in our Sunshine Scrappers here in Florida. One of my favs (cause most if not all are a fav in many ways) is the Bohemian Bazaar. Thanks for sharing your wonderfuls tags. What absolutely beautiful tags! I just love your designs. My favorite collection is Baby 2 Bride.